hen assessing the selfinsurance landscape and business opportunities abroad, there’s no place like a home away from home for greater comfort. And the operative word is America. Repke sees quite a bit of crossover between corporations from the U.S. and those in various countries with positive growth in their business environments such as Argentina, Brazil, Chile, Panama, Columbia, Costa Rica and Mexico. Scores of U.S. multinational companies, including Microsoft, IBM, Coca-Cola and Big Three automobile manufacturers do business in the region. One obvious reason is convenience. It’s a short trip to any of these nations relative to other parts of the world, he observes. So in terms of medical tourism, for example, Californians can find high quality medical care in Tijuana or Monterrey, Mexico rather than traipse over to the Ohio-based Cleveland Clinic. “It’s not like getting on a plane and going to Thailand,” he says. Latin American aspires to modernize many of its insurance offerings to be more responsive to the needs of a growing middle class, explains Michael Feighan, SVP and U.S. head of accident and health with Aspen Insurance and a member of SIIA’s International Committee. He’s bullish about Brazil, even with recent financial problems, as well as Columbia, Chile and Peru in Latin America, while Panama and Costa Rica are driving forces in Central America. Another point he makes is that many U.S. residents know Spanish, which is spoken across Latin America. “We think their growing economies afford more and more opportunity going forward,” Feighan says. Gross domestic product is expected to grow 2.4% across Latin America in 2018, according to FocusEconomics, which publishes economic forecasts from the world’s leading economists, while the International Monetary Fund expects 2% growth and 2.5% “over the medium term.” Any bright forecasts come on the heels of dark times. A World Bank report notes that an economic slowdown lasting six years plagued the region, along with Caribbean nations. Stronger household consumption and an improvement in investment were credited by FocusEconomics for driving Brazil’s economy last year, while a resilient labor market and higher export revenues drove growth in Chile. The same report noted that higher commodities prices helped Colombia, though natural disasters and high inflation eroded Mexico’s economy and a lack of investment and mismanagement crippled Venezuela. Potential drawbacks While working on self-insured solutions in Latin America invites plenty of opportunities for self-funded employers and service providers alike, particularly in the reinsurance area, there also are some drawbacks to consider. The biggest potential downside is “picking wrong regions or markets to go into,” cautions Feighan, who cites Venezuela as the region’s weakest link. He believes Latin America is no different than Europe or Africa, which also have their share of volatile nations to avoid. Another big challenge is that while medical tourism involving U.S. employees seeking care in Latin America features impressive results in terms of costs and outcomes, ongoing care isn’t so cut and dried. “Not every surgery is 100% successful, and you don’t necessarily know that right away,” observes Les Boughner, chairman of Advantage Insurance Management (USA) LLC and an active SIIA member. A hip or knee surgery in Costa Rica makes sense, he says, but what happens if it requires ongoing care? “You can’t just pack up and fly down again necessarily,” he adds. “You want that care to be local and responsive, and that’s why partnerships are very important.” Some climates may be inhospitable to certain solutions. In Argentina and Brazil, for example, Boughner says “it’s patently illegal to use captive insurance companies for self-insurance purposes.” Across the rest of the region, he adds that “the challenge is how do you execute a fully compliance self-insured program that varies by country.” And in some cases, he explains that bureaucratic hurdles erode the cost benefits associated with group captives. Each country across the region has its own government and set of regulations that don’t always make sense to U.S. businesses, which Repke describes as more of a yellow than a red flag. Since the health insurance business has become so commoditized, he believes Latin America is fertile ground for TPAs as well as brokers in the group accident and health market to expand their footprint in the global economy. Still, these issues may pale in comparison to elsewhere around the world. While China and India represent enormous markets relative to Latin America because of their population, Feighan points to complications. For example, non-Chinese companies have cornered only 1% to 2% market share between cultural reasons and skepticism about foreigners. He says it’s difficult to forge long-term relationships in India for similar reasons. In addition, there are unorthodox practices relative to the U.S. Not all third-party administrators (TPAs) in Latin America, for instance, work only on self-funded accounts. Repke says many of them also act as the administrative back room for fullyinsured carriers. And in Columbia, he says benefit brokers actually administer claims for the health plans that they sell. in first-class medical facilities in Latin America, particularly Costa Rica, according to Boughner. He believes the low costs and high quality associated with medical tourism will help save U.S. health care. In many cases, he notes that physicians in these countries were educated in the U.S. where they also worked and honed their craft. Quinta Real, Monterrey, Mexico Across Japan, Korea, Singapore and Hong Kong where it’s easier to do business, he notices a similarity to Latin America in that populations have been underserved in the insurance space. But distance represents a big challenge. A huge difference between the U.S. and Latin America, of course, is socialized medical systems that Repke says is “very similar” to the U.K, France or Israel. But there’s also a privatized option for employees at U.S. multinationals with Latin American subsidiaries or local businesses who’d rather not queue up for government-provided care and can afford to pay more. “They’re interested in learning from us just as we are interested in learning from them,” Repke explains, noting how it drives SIIA’s international strategy. 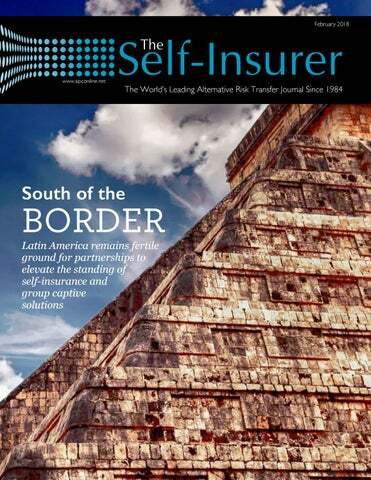 Don’t Miss SIIA Conference in Monterrey, Mexico Registration is now open for the Self-Insurance Institute of America, Inc. (SIIA) Latin America-focused International Conference, scheduled for April 17-19, 2018 in Monterrey, Mexico. The event is designed to help attendees identify and understand self-insurance business opportunities in Latin America To further highlight the opportunities of this last point, attendees will have the opportunity to tour selected medical facilities in Monterrey to see and hear first-hand how they are currently positioned to partner with forwardlooking self-insurance industry players in the United States. It’s very easy to get to Monterrey, with direct flights from more than a dozen major U.S. airports and the conference will be held at the beautiful Quinta Real Hotel – check it out on-line at www. quintareal.com There are limited sponsorship opportunities who want to promote their corporate brands with event. For immediate assistance, contact Justin Miller at jmiller@siia.org Detailed event information can be accessed on-line at www.siia.org, or by calling 800/851-7789. The distribution of insurance as a whole is inefficient and fragmented across Latin America where there’s great interest in controlling losses in the face of high rates, Boughner reports. That’s why it’s such a hotbed of activity for self-insured and group captive solutions. When choosing overseas venues for annual conferences, SIIA’s International Committee has a twofold mission, he explains. One is educating the local community about the advantages of self-insurance, while the other is that it allows U.S. suppliers to the self-insurance community to examine business opportunities, while also educating companies in that particular area. “You not only provide the education, but you learn about what the opportunities are in that country,” Boughner says. Bruce Shutan is a Los Angeles freelance writer who has closely covered the employee benefits industry for 30 years. oon after the New Year, the U.S. Department of Labor (DOL) issued a regulatory proposal to increase the accessibility of association health plans (AHPs) for small business and self-employed business owners. This proposal, or Notice of Proposed Rule-Making, was a follow-up to the Presidentâ&#x20AC;&#x2122;s Executive Order, issued in October of last year, directing federal agencies to develop guidance that would expand the formation of both fully-insured and selfinsured AHPs. In this article, we will examine the past and potential future of AHPs, as well as its impact on self-insurance. Past Treatment of AHPs Despite some congressional activity on the issue as recently as 2017, very little policy movement has been made on expanding the use of AHPs since changes were first proposed back in the late 1990s. Particularly, no past reform effort has successfully included AHP changes that provide the ability to self-insure. In the wake of Affordable Care Act (ACA) implementation, the Obama Administration issued guidance in 2011 that essentially prohibited small employers from forming a fully-insured ‘large group’ health plan. This meant that the ACA’s ‘small group’ market reforms applied to fully-insured AHP employer members with 50 or less employees. The one exception to this guidance was if the AHP formed a fullyinsured “bona fide group or association of employers” as defined under ERISA, not applying to the ACA’s “small group” market reforms. This guidance did not apply to self-insured AHPs, instead applying State “multiple employer welfare arrangement” (MEWA) laws to self-insured plans. Because this action is being taken under regulatory authority and not a change of law by Congress, the agency may only maneuver within the confines of current ERISA law and past guidance. This limitation of action within the current law very much restricts what the DOL may do, particularly with issues arising from federal pre-emption and issues across multiple states absent a common metropolitan geographic area. Related and Unrelated Employers The proposed guidance really comes down to how it treats various types of employers, and how those employers may band together to form AHPs within a specific or broad geographic area. To that point, the proposal allows two scenarios for which employers may form AHPs. In the first scenario, related employers from the same industry or profession may form a plan, regardless of geographic location. In this scenario, an association of widget makers from 3 different states could form an AHP to provide health insurance to their members and member dependents. In addition, franchisee employers tied to the same parent company could also set up an AHP and offer health coverage to the franchisees’ employees regardless, regardless of where the employer is located. Current AHP Proposal Fast forward to 2018. The DOL Notice of Proposed Rule Making (NPRM) on Association Health Plans, issued in the beginning of January, is the first step in the implementation of potential regulatory guidance to expand AHPs. The overall goal of this initial rulemaking is to expand affordable health coverage among small employer groups and self-employed individuals by removing restrictions under current ERISA law. This is essentially accomplished by treating the association itself as the employer sponsor of a single plan. similar metropolitan area. In this case, a local Chamber of Commerce, representing different industries and professions, may form a self-insured AHP in the New York tri-state market, but not across multiple states like Colorado and Idaho. This means that a bakery and a dry-cleaner located in the same city, county, or State could, for example, join their local Chamber’s AHP. example, Uber drivers, considered working owners in this scenario, could establish an AHP in which Uber drivers all across the country could receive health coverage. Health Coverage as Sole Purpose The AHP proposal also has several other important factors. Working Owners: Self-Employed Individuals First, and divergent from past regulatory treatment, self-employed individuals with no employees, otherwise known as ‘working owners,’ may participate in an AHP. For the first time, self-employed individuals with no employees (referred to as “working owners”) could participate in an AHP. In the past, AHP formations could only be done by an association that was already established for a specific purpose other than health care. For instance, the Widget Manufacturing Association could be organized for the purpose of growing and supporting the widget industry. This prevented associations from forming for the single purpose of offering health benefits and little else. This long-standing rule would be drastically changed by the proposed rule, which would allow an organization to establish an AHP to do just that - for the sole purpose of offering health coverage. In fact, an AHP could be established by employer members and/or working owners even if there (1) is no pre-existing organization and (2) the AHP is established for the sole purpose of offering health coverage. Nondiscrimination Rules One important proposal to note is that AHP’s cannot refuse coverage based on health factors, and may not use such health factors to vary premium. This was done to encourage not only strong plans, but to assuage critics who have been vocal in their opposition to so called “skinny plans.” Under the proposed nondiscrimination protections, employers or working owners are prohibited from refusing AHP participation to an eligible employee based on any “health factor, “which includes: health status, medical condition (including both physical and mental illness), claims experience, receipt of health care, medical history, genetic information, evidence of insurability, and disability. Similarly, the premiums for the “large group” AHP health coverage cannot be varied based on a particular participant’s “health factor.” The same proposed rule also includes benefits, which cannot be different based on these same factors. The only ability to differentiate AHP variables is due to bona fide employment-based classification like: full-time vs. part-time employees, union vs. non-union, employees located in different geographic locations, different occupations, date of hire, and length of service. For example, the National Widget Association offers AHP health coverage to its employer and working owner members. Widget-Maker A is located in Massachusetts, Widget-Maker B is located in Minnesota, and Widget-Maker C is located in Alabama. The premiums for the AHP coverage are higher for Widget-Maker A in Massachusetts than the premiums for Widget-Maker C in Alabama. So long as the price differential between Widget-Maker A and Widget-Maker C is reasonable, such premium differential does not violate the nondiscrimination rules (and is permissible) because the premiums vary due to different geographic locations. In our current reading, the proposed AHP regulations in no way impact States’ ability to regulate self-insured MEWAs through their own laws. As a result, all of the current State MEWA laws would continue to apply to self-insured AHPs. Importantly, States could augment laws in the future, should they want to place further requirements within their state. Self-Insured AHPs & State Regulation Considering the proposed rule must be applied under current strictures of law, it walks a fine line between respecting the insurance regulatory authority of states and the federal authority to expand AHPs. Under the proposal, a self-insured AHP would be considered a self-insured multiple employer welfare arrangement (MEWA). ERISA explicitly gives States the authority to impose any State insurance law requirement on self-insured MEWAs. At this point, most if not all States have done this by enacting State MEWA laws, though some are more onerous than others. For example, some States have an outright prohibition on self-insured MEWAs. Other States require an eligible MEWA to receive a “certification” from the State Insurance Commissioner proving it has complied with various reserve requirements, and in some cases, benefit mandate and/or premium rating requirements. At this point, it appears that a self-insured AHP must satisfy each State MEWA law in each of the States in which the AHP coverage is offered if offered to employees in multiple states. This fact may limit the extent to which self-insured AHPs are formed, despite the additional flexibility the DOL is providing to employers and working owners when it comes to AHP formation. One important note is that, as part of the proposed regulations, the DOL did ask for comments, through a Request for Information or RFI, on whether the DOL should issue a “class exemption” that would preempt the non-solvency requirements of all State MEWA laws. The expansion of a “class exemption” would essentially allow self-insured AHPs to avoid State MEWA statutes, and instead, offer health coverage in multiple States in accordance with uniform rules and requirements set forth in the class exemption. What Happens Next? The DOL is now seeking comments by early-March on the overall proposed rule, which the agency will then review and consider further changes before rule finalization. In addition, the DOL is also seeking comments on the “class exemption” RFI on potential state pre-emption of State MEWA laws. This RFI is a pre-curser to a potential future rule-making process and will not be included in the final AHP regulations. Over the next several weeks, SIIA will be conducting committee meetings and outreach to gain feedback on implications, potential changes and overall recommendations to formulate comments and feedback to the DOL. Please contact Ryan Work (rwork@siia.org) or Chris Condeluci (ccondeluci@siia.org) with any questions or comments. ith overtones of “The Grinch Who Stole Christmas,” the Internal Revenue Service (IRS) began late last November to send notices of penalties using IRS Letter 2261 to employers as it sought to enforce the Employer Mandate provision of the Affordable Care Act (ACA). “It was a really awful Christmas card to get,” said a SIIA member, an executive of a benefits management company who requested anonymity. The member noted that its client companies received notices of proposed penalties for 2015 ranging from $800,000 to $6 million just at the start of the holiday season. Nunes (R-CA) and Rep. Mike Kelly (R-PA) that would waive employer mandate penalties retroactively for 2015-2017 and prospectively for 2018. SIIA lobbyists advocated support for the waiver bill among members of Congress. “We continue to look at legislative vehicles to include waiver language, including a potential omnibus spending bill likely under consideration sometime in January,” SIIA’s Ryan Work said. The result of that legislative effort was not known by the deadline for this issue. “There was general confusion and concern among many employers who thought they were doing all they could to comply with the employer mandate,” he said. “The IRS reporting forms are very complicated,” Roehrenbeck said. “Especially for small and medium-sized employers they’re a real struggle.” He cited one employer’s data entry issue where examining one reporting column out of context can make it appear that an employer had not offered a health plan to employees, when in actuality it had. For that employer, the penalty would have been more than $300,000 under the IRS formula of approximately $2,000 per full-time employee, regardless of how many employees may have joined an ACA exchange and received a premium tax credit. “There’s a case to be made that the incentive goal of the employer mandate is unnecessary,” Roehrenbeck said. “Most companies provide coverage even in the absence of a mandate. Even among industries such as hospitality, retail, temporary staffing and others where coverage offerings were historically limited, there may now be market currents that support employer health plans going forward.” Roehrenbeck agreed that immediate Congressional action on an employer mandate penalty waiver would be a positive step for the industry, but thought longer-term legislation could be even more positive “if Congress will allow employers greater flexibility of coverage and decreased regulatory burden.” SIIA will report on any related developments to members via digital platforms. Questions or concerns are welcomed by Ryan Work at rwork@siia.org or (202) 595-0642. Members of the industry view the ACA’s employer mandate as an awkward attempt to incentivize employers to provide health plans but in practice may result in the opposite effect. he collaborative effort between SIIA and the Maine Bureau of Insurance (BOI) to determine the future of small group stop-loss insurance in the state has taken a significant step forward with an informal conversation last month between a SIIA delegation and BOI officials including Superintendent Eric Cioppa and his top policy advisors. The project to create new small group regulations in Maine was initiated last fall with a stakeholders hearing agenda that included open questions regarding the use and scope of stop-loss insurance for employer-sponsored self-insured health plans. Last month’s smaller, less formal meeting was different. “We were able to visit with all the BOI’s top decision makers in a very congenial atmosphere,” said SIIA vice president of state government relations Adam Brackemyre who went to BOI headquarters in Gardiner, Maine, along with SIIA members Robert Melillo and Eric DuPont of The Guardian Life Insurance Company of America (Guardian), and Catherine Bresler of Starmark, a subsidiary of The Trustmark Companies. “A few months ago there was a possibility of legislation that would have prevented the sale of stop-loss in the small group market,” Bresler said. “In the in-person meeting we were able to get a sense of the bureau’s direction. I would say our worst fears were put to rest. Catherine Bresler said the Bureau’s openness to learning about stop-loss insurance and other aspects of self-insurance may have future broad implications as Superintendent Cioppa moves up next year from vice president to president of the National Association of Insurance Commissioners. “Both the Superintendent and BOI general counsel Bob Wake are highly regarded among the NAIC leadership, so it was a great signal that it’s important to them to gain greater understanding of stop-loss insurance,” Bresler said. In previous years some tension existed between the self-insurance industry and the NAIC as the organization promulgated restrictive model laws regarding the use of stop-loss insurance for adoption by states. Catherine Bresler The BOI’s review of stop-loss insurance began when a bill that would adversely affect its use in the state was introduced last year. The legislature didn’t advance that bill, but asked the BOI to review with subject for possible new rules. “The good news is that we didn’t sense the BOI feels there is a problem with misuse or a basic flaw in the stop-loss product,” said Robert Melillo, head of stop-loss for Guardian. “Moving forward, we expect the Bureau to convene another broad stakeholders meeting before establishing new rules,” said Adam Brackemyre. “It appears that the Bureau is positioned to establish standards without new legislation and are taking a very thoughtful approach.” SIIA will continue to update members on this issue through various digital platforms. Questions or comments are invited by Adam Brackemyre at (202) 463-8161 or by email, abrackemyre@siia.org. Wellness Program Incentives and Recent Litigation The AARP v. EEOC case heated up again prior to the end of 2017. If you recall, the AARP filed suit in the District Court of D.C. in October of 2016 to dispute the EEOC’s conclusion in its 2016 final regulations that a 30% incentive limit for wellness programs was “voluntary” for purposes of the ADA and GINA. The AARP also disputed the EEOC’s conclusion that incentives provided in exchange for the medical history of the employee’s spouse, but not the medical history of the employee’s children, did not violate GINA. Under the ADA and GINA, wellness programs that ask certain questions or require medical exams must be voluntary; however, neither the ADA nor GINA define “voluntary.” In addition, GINA prohibits requesting, requiring or purchasing the medical history of an employee’s family, including but not limited to the employee’s spouse. The District Court found that the EEOC failed to adequately explain its conclusion that incentives and surcharges equal to or less than 30% are voluntary and decided to remand to the EEOC for reconsideration without vacating the portions of the rule challenged by AARP—indicating that vacatur would cause too much disruption for existing wellness programs. In a surprising reversal, the Court changed its mind in December and vacated the rules challenged by the AARP effective January 1, 2019.
incentive based wellness programs. But is the end really near for such programs? The EEOC has indicated that it plans to issue a new regulation in late 2019 that will be effective in 2021 at the earliest—so there will likely be a period of time without the final rule. Those opposed to the EEOC’s rules will say that the Court’s decision in the AARP case to vacate the 30% rule means that employers may not offer any incentives or impose any surcharges in connection with disability related inquiries and/or medical exams. But history tells us something quite different. The term “voluntary” in the ADA is largely undefined and the EEOC’s pre-final rule enforcement guidance was best described as ambiguous. Ambiguity has a way of breeding flexibility and so it was not uncommon for employers to offer incentives or impose surcharges in connection with disability related inquiries or medical exams that would far exceed the 30% standard established by the EEOC in the final rule—and to do so with impunity. By way of illustration, the court held EEOC vs. Orion Energy Systems that Orion’s 100% surcharge imposed on non-participating employees was voluntary because the employee could choose whether to participate. Once the vacatur goes into effect, the post 30% landscape should look very similar to the pre-30% landscape where incentives and surcharges connected to disability related inquiries and/or medical exams existed in abundance. That is not to say that there is no risk if incentives are provided or surcharges are imposed— even ones that are equal to or less than 30%. There is still risk without that final rule that the incentive or surcharge is coercive and the risk may have increased slightly due to the fact that a federal judge has actually vacated that 30% rule --but history gives no indication that incentive based wellness programs will die January 1, 2019. The impact the vacatur will have on incentives or surcharges for a spouse’s medical history remains unclear but like incentives and surcharges in connection with disability related inquiries and medical exams, pre-final rule wellness programs did provide incentives or impose surcharges in connection with a spouse’s medical history. More importantly, the literal language of the statute does seem to permit an employer’s program to acquire a spouse’s medical history so long as it is done through a wellness program and the employer obtains the employee’s consent in advance of collecting the information. The future of wellness program incentives undoubtedly will undergo changes in the very near future with or without further EEOC guidance. Employers should work with counsel to carefully review their programs and program incentives in this period of change. o two groups are exactly alike and no one Reference-Based Pricing program design is right for them all. That’s why HHC Group starts by learning each group’s objectives and constraints. Then we help design and implement the right Reference-Based Pricing program for them. Some want pre-cert and concierge services. Others want just claims repricing or repricing, provider appeal support and patient advocacy. Some want customized models and some provider contracting. We have the experience and expertise to help the group design and deliver the RBP program that’s just right for you. hile U.S. captive domiciles have become more numerous and competitively inviting, offshore domiciles are still a major draw for new captives. Even as U.S. states have become more active in the captive insurance arena, offshore domiciles are still growing, albeit with fewer captives from the U.S. In recent years, growth in those markets have been driven by China and South Americaâ&#x20AC;&#x201D;two regions just entering into the captive marketplace. An offshore captive domicile is any entityâ&#x20AC;&#x201D;territory, nation, or regionâ&#x20AC;&#x201D;that is not a state in the U.S. and has the ability to regulate captive insurance companies through captive law on its books. When the formation of captive insurance companies expanded rapidly during the early 1980s, there was only a few states that were trying to establish themselves as captive regulators. Also, at the time regulations in the U.S. made forming and operating an onshore captive prohibitively expensive. The regulatory environment in offshore domiciles, primarily those in the Caribbean, is generally considered less rigorous than U.S.-based captive domiciles. The perception is that offshore domiciles are “tax havens” for those companies wishing to avoid paying taxes. Most of these domiciles are working towards dispelling that reputation. The Caribbean Financial Action Task Force (CFATC) works with member nations and territories to address the problem of money laundering, terrorist financing and other illegal financial transactions. The CFATC operates similarly to the National Association of Insurance Commissioners by evaluating their members’ ability to effectively regulate insurance and other financial dealings. While it is a work-in-progress for offshore domiciles to build up their reputations, these domiciles don’t get to be the largest domiciles, as in the case of Bermuda and Cayman Islands, without diligently monitoring their domesticated captives or without cooperating with foreign governments. The attractions that remain for domiciling captives offshore are the often lower start-up costs, the lower capital requirements—as low as $10,000 for a single owner captive in one case, low or no taxes, flexible regulation, and the opportunity for a broader range of investments. There are also some specific third-party risks that can be insured offshore more readily. Another added benefit is that many offshore domiciles have been regulating captives far longer than most U.S.-based state domiciles and have the infrastructure to support their work. As of the end of 2016, of the captive domiciles ranked in the top 10, five are offshore territories, three are U.S. states, and two are sovereign countries, according to the rankings published by Business Insurance in March 2017. Ranked from one to ten are: Bermuda, Cayman Islands, Vermont, Utah, Delaware, Guernsey, Anguilla, Nevis, Barbados, and Luxembourg. Each of these domiciles have their differences and specialties. Below are profiles of the seven domiciles not located in the United States. Bermuda is a British Territory in the North Atlantic and a two-hour flight from the U.S. It has a long history of domiciling companies investing in self-insurance, including what is considered the first modern captive in 1952. By the early 1970s, the domicile was believed to have more than 100 captive selfinsurance entities. In 1978, Bermuda enacted captive legislation and standardized licensing and regulatory procedures, becoming the first country to do so. Boasting itself as a “blue chip financial centre,” Bermuda is one of the leading reinsurance centers in the world. With its easy access to both the United States and to Europe, its long history of stability, and solid reputation as a financial center, Bermuda will likely dominate captive rankings for some years to come. Cayman Islands claims to have “robust, commercially-minded regulation,” according to the Insurance Managers Association of Cayman. A Caribbean British territory, located south of Cuba, the Cayman Islands has usually ranked number two or three in captives during the last ten years. Following closely on Bermuda’s footsteps, this domicile began seriously courting captives in 1979 and since its entrance into the captive marketplace has focused heavily of healthcare-related captives. Also like Bermuda, Cayman has a unique infrastructure built to facilitate and support captives, which is why it can hold its own as one of the top captive domiciles. The Bailiwick of Guernsey is a British Crown dependency composed of three islands located in the English Channel near the French coast. Guernsey has long been a financial center for Europe, especially in regard to reinsurance. It officially began courting captives with legislation passed in 2002, although the dependency did have captive insurance companies domiciled there previously. It is a leading captive domicile in Europe and, as it is not a member of the European Union, it is not subject to Solvency II rules. Instead, it has adopted similar rules that are more suitable to their needs as an offshore regulator. The domicile prides itself on its innovation and claims to have developed protected cell captives in the late 1990s. stop loss limited benefit health plans short-term medical medicare supplement Rated A+ by A.M. Best Company. Rating as of Dec. 19, 2017. For the latest rating, visit ambest.com. Anguilla is relatively new to the captive marketplace in comparison with many other offshore domiciles, having enacted captive legislation in 2003. However, the British territory located east of Puerto Rico, has steadily become one of the most talked about domiciles. It specializes in small to mid-sized captives by creating a regulatory environment that is cost-effective for small and medium-sized companies. Captives are not required to appoint local directors or to hold annual meetings in the territory and the fee structure is lower than that of comparable offshore domiciles, which makes it an attractive destination domicile for companies that are far from the Fortune 500 list. many of its captives insuring Canadian companies. Unlike other offshore domiciles, Barbados does charge some premium taxes. Specializing in reinsurance captives, Luxembourg is the leading captive domicile in the European Union. Located in the heart of Europe, between France and Germany, the small country of Luxembourg took the lead as a captive domicile with legislation passed in 1984 allowing for the formation of reinsurance captive insurance companies. The costs of starting and maintaining a captive in this domicile can be quite expensive, with both fees and taxes levied on domiciled companies. However, as part of the EU, being domiciled in Luxembourg allows the captive to cover risk throughout EU member countries without prior authorization. The Federation of Saint Kitts and Nevis, generally referred to as Nevis in its capacity as an offshore domicile, is also new to the captive arena, having passed legislation to host captives in 2004. The dual island nation, located east of Puerto Rico, is making a name for itself as a strict regulator while charging only moderate fees and having low capital requirements. s more employers self-fund their employee healthcare coverage, exploration of risk reduction and cost-saving initiatives for healthcare, especially hospital charges, has become increasingly important. Self-funded employers are uniquely empowered with the ability to design plans having increased focus on controlling and reducing the risk within the underlying benefit plan to generate greater loss-cost savings. Reference-based pricing, direct provider contracting, increased use of alternative provider networks, and â&#x20AC;&#x153;medical tourismâ&#x20AC;? are examples of increasingly popular strategies being implemented by self-funded programs to reduce hospital charges. Even a change to a more appropriate provider network can yield significant savings. The objective of this discussion is to provide an introductory overview of some of the innovative tactics being employed by self-funded plans and stop loss captives to reduce the charges for healthcare by providers. different prices that in turn receive different discounts. For example, a Blue Cross network could receive a 60% discount from billed charges and a competing Aetna network may only receive a 40% discount for the same procedure. However, the Aetna network may be charged only $5,000 for the procedure while the Blue Cross network is charged $7,500. Even though Blue Cross has the deeper discount off billed charges, the end cost is the same for both. In some cases, the “smaller discount” might even work out to a lower end price. The key to realizing effective savings is being able to attain discounts in relation to the amount of the hospital’s profit margin rather than relying solely on discounts from billed charges. A progression of popular strategies: Each of the following initiatives represent increasingly effective strategies that can be implemented by self-funded employers to reduce the overall cost of hospital charges. •	Employ the most appropriate PPO network: Many stop loss carriers actuarially evaluate provider networks and assign rate adjustment factors for the stop loss coverage based on the actual value of the network’s discounts from providers.The strength of any network will vary depending on its market presence in any geographic market location. Working with a stop loss carrier to help determine the most appropriate network based on actual discounts within geographic locations of the employee population can yield significant cost savings for the benefit plan. emergency care outside of the network related to the selected tier. The most critical element to the success of an alternative network is not sacrificing the quality level of providers or care in favor of discounts. The value of the discounts needs to be commensurate with the restrictiveness of the network and the plan appropriateness of “carrot (reward) or stick (penalty)” incentives to employees. As a stop loss carrier, QBE was notified of a situation where a 22 year-old college student covered under his parent’s policy needed infusion therapy. Upon review, QBEs medical risk management team determined that most of the expense related to the infusion regimen were associated with charges for administering the infusions in a hospital rather than the cost of the medicine itself. QBE arranged for the infusion to be done in the university’s health facility by a professionally contracted infusion nurse rather than at the hospital. This essentially converted the claim to a level comparable with a home-based infusion which eliminated nearly all the hospital expenses including the related profit upcharges. The resulting savings was nearly 60%. It was also more convenient for the patient as he could be treated a block from his residence hall rather than miles away at the hospital. •	Alternative treatment venues: Large hospital systems are typically the most assertive entities in terms of aggressive and opaque profit markups in the healthcare industry. Application of innovative means for reducing or even eliminating hospital charges through alternative treatment venues, such as physician-owned surgical centers and home healthcare treatments, can yield extraordinary savings for a self-insured employer. Switching a treatment venue from a hospital to an out-patient facility has become common for treatments such as dialysis and chemotherapy and can and routinely save as much as 50% for the treatment. Not only can this strategy significantly reduce the direct expenses incurred by the employer’s plan by more than 50%, it will often prevent a claim from reaching the specific attachment of the stop loss coverage which will contribute to a positive and measurable impact at renewal of the medical stop loss policy. •	Direct Provider Delivery As the concept of alternative treatment venues expands, a boutique industry is also being created by innovative providers that don’t accept insurance and offer highly transparent, direct, upfront “package pricing” for complete episode treatment in specific facilities. Services are typically performed in physician-owned surgical facilities for nonemergency general, coronary, orthopedic, or bariatric surgical procedures, and common cancer treatments. Again, by eliminating the huge profit markups associated with hospitals and large healthcare systems, as well as the administrative costs associated with insurance management, these entities can offer all-inclusive treatment at much lower cost to a self-funded employer. A self-funded employer can pay an upfront “capped” price of $25K for a complete (all-care inclusive) hip replacement at an independent surgery center that would otherwise cost anywhere from $45K- $85K for typical hospital charges. Savings approaching 75% in comparison to typical hospital procedures are not uncommon from these boutique providers. •	Medical Tourism: Medical Tourism in which the benefit plan will pay for employees and even a companion to travel to other lower cost venues, including different countries, for qualitatively comparable treatment is rapidly gaining popularity among self-funded plans. Domestically, there are huge variances in the cost of care, not only from one state to another, but even one county to another. Some of the best facilities for care in the U.S., such as Cleveland Clinic or Johns Hopkins, can also be among the least expensive. The cost of the hip replacement, discussed earlier, can run $80K in a northern California hospital and $40K at a comparable facility in southern California, and maybe even $25K at an independent surgery center. Internationally, Cayman, Paris, Prague and Panama; each can all offer world-class medical care at less than half the cost of treatment in the U.S. The hip replacement that was reduced to $25K at the independent surgery center in the U.S. can be done for about $15K, including rehab, plus travel in Grand Cayman, Holland or France. The care is toptier and the patient’s self-funded employer will also cover travel and accommodation for the patient and a companion. Most plans will waive all out of pocket expenses, and some innovative plans will even refund a percentage of savings to employees as an added incentive for traveling for lower cost, but qualitatively equivalent, treatment. The savings to a self-funded employer can be substantial. between 40% - 80%, e.g., Medicare + 60%. RBP plan design can also take the form of a defined benefit schedule. This type of schedule specifically defines the maximum dollar amount assigned by the benefit plan for each specific treatment or procedure. Many defined schedules will specifically target and limit high-margin hospital charges such as infusion and dialysis treatments, durable medical supplies, and multinight hospitalizations. As self-funded plans have more plan design flexibility, RBP designs have become increasingly prevalent as a cost-containment strategy. •	Application of “Big Data” More data is now readily available throughout the universe than ever before. Larger self-funded employers, and those using captives, are increasingly accessing and mining large amounts of data to identify claim trends and large cost drivers within their benefit plan. With 100% pass-through arrangements, straight-forward rebate reimbursement and clear and honest contract terms, Script Care has spent over 30 years developing relationships that last. You’ll never see deceptive clauses that artificially inflate guarantees or true-ups riddled with caveats. A reputation of integrity and transparency means that, with Script Care, our #1 priority is instilling confidence in our clients. Use of external data to analyze specific industry, geographic and demographic trends for comparison with the employer’s own data will help employers identify potential benefit plan modifications to address both claim frequency and severity. The primary issue for data users is how to effectively distill huge amounts of data into useable information for predictive modeling. To succeed, the employer must start with clear objectives and know what specifically they are trying to measure. Data benchmarks could include: underwriting probability; specific claims trends; or qualitative outcome trends within specific geographic areas, diagnoses or even specific healthcare providers. The objective of the analysis needs to be clearly defined in order to know what formation needs to be extrapolated. The resulting data can be applied to the benefit plan design to determine and structure targeted cost containment strategies. These are just a few overview-level examples of the progressive strategies that self-funded employers can exercise to reduce the cost of healthcare charges. Healthcare value is measured by two components, quality of care and price. The two components can be mutually exclusive. As mentioned earlier, there is a significant variation in hospital prices, even for the most common procedures. The expanding selection and availability of alternative provider networks and treatment venues, along with innovative platforms for enhanced consumerism will help self-funded employers reduce high costs associated with hospital charges. Hospitals and healthcare systems are facing cumulative pressure to publish their pricing structures and make them more accessible to consumers. Improved transparency empowers employers to adjust plan design strategy to provide improved healthcare value and broaden the opportunities for reducing the cost of healthcare delivery to employees. elf-Insurance industry executives from around the country will have the opportunity to participate in an industry “Town Hall” event as part of SIIA’s upcoming Self-Insured Health Plan Executive Forum, scheduled for March 5-7, 2018 in Charleston, SC. Consistent with this interactive theme, attendees will also choose in real time which exhibiting companies should be given opportunities for quick (5-minute) presentations to highlight the best of their service/product offerings. In other words, much of the content and dialogue is going to be created in real-time by attendees â&#x20AC;&#x201C; this will be an entirely fresh and faster paced conference experience. The rest of the educational program will incorporate a mix of faster-paced educational sessions where the audience will be able to directly engage with the presenters through the technology feature, open discussion forums. Since the program was previously announced, we have added as session focused on the timely subject of health plan fiduciary considerations. To round things out, the program will also feature a hosted luncheon with a presentation about one of the most fascinating Civil War stories that took place in the waters just off the coast of Charleston. Detailed event information can be accessed on-line at www.siia.org, or by calling (800) 8517789. Newly named COO brings decades of benefits experience to an industry-leading team Lockton Benefit Group (LBG) is pleased to announce the addition of Mike Mascolo as Chief Operating Officer (COO). In his new role, Mascolo will focus on coordination and collaboration across the benefits group as well as play an essential role in working with insurers and other business partners. Mascolo is highly regarded in the benefits industry for his client consulting and management skills. He has been in the healthcare and insurance business for more than 20 years, spending the last decade with Wells Fargo Insurance. “I’m thrilled to welcome Mike as COO. His stellar reputation in our industry, coupled with his personable nature, makes him a natural fit for Lockton,” said Bob Reiff, President, Lockton Benefit Group. “We have some of the best minds in the business and Mike’s leadership will certainly enhance our already outstanding capabilities.” In his most recent role as the Employee Benefits National Practice Resource Leader for Wells Fargo Insurance, Mascolo guided his client consulting teams in their thought leadership and resource development activities. Under his direction, the Employee Benefits Practice implemented a data-driven performance and execution model to deliver outstanding client solutions through an innovative alignment of resources and enhanced priority action planning. “Lockton has a great reputation for client advice and innovation,” said Mascolo. “I’m excited to join this winning team and look forward to new successes for our clients and the continued growth of our benefits business.” Mascolo will be based out of Lockton’s Kansas City, Missouri office. About Lockton Lockton is a global professional services firm with 6,500 Associates who advise clients on protecting their people, property and reputations. Lockton has grown to become the world’s largest privately held, independent insurance broker by helping clients achieve their business objectives. Podcast Title: Breaking Down the GOP Tax Bill and How It Affects You Description: In this special edition of the podcast, The Phia Group’s CEO Adam Russo and Attorney Brady Bizarro discuss the new GOP tax bill in depth. Specifically, how does the bill affect employers? What does the repeal of the individual mandate mean for the self insured industry and for the future of Obamacare? Link: https://www.phiagroup.com/Media/ Posts/PostId/656/empowering-plans-segment-25-a-taxing-time About The Phia Group The Phia Group, LLC, headquartered in Braintree, Massachusetts, is an experienced provider of health care cost containment techniques offering comprehensive claims recovery, plan document and consulting services designed to control health care costs and protect plan assets. By providing industry leading consultation, plan drafting, subrogation and other cost containment solutions, The Phia Group is truly Empowering Plans. Visit www.PhiaGroup.com. HIIG A&H is a division of Houston International Insurance Group, specializing in Medical Stop Loss and other Accident & Health coverages with offices in Malvern (PA), Wakefield (MA), Kennesaw (GA) and Dallas (TX). As a direct writer, HIIG A&H provides insurance products through HIIG’s wholly owned subsidiary insurance companies. HIIG Accident & Health (HIIG A&H) a division of Houston International Insurance Group (HIIG), announced that Peter L. Burdo has joined the Company as Director of Regional Sales, reporting to E. Matthew Paul, Senior Vice President of Sales. He will be focused on expanding the Company’s Medical Stop Loss business in the Midwest. The product will continue to add to its more than 90 different Episodes of Care priced as bundled payments for treatment categories such as cancer, behavioral health, cardiac/vascular health, men’s health, women’s health, GI conditions/procedures, maternity, orthopedic, neurosurgery, ophthalmology, endocrine, ENT, pulmonary issues, and more. As payers, providers, policymakers, and consumers struggle with how to make healthcare more affordable, it’s essential to have the pricing and analytic tools that will provide the solutions with the greatest impact, and that’s what Payer Compass and Altarum are offering with the new Bundled Payments Program. Honed and perfected individually for more than ten years, these solutions are now combined and available to solve many of the challenges faced by payers and providers as reference- based pricing and value-based care become the realities of healthcare. If you would like more information about this healthcare initiative, please contact Ginger Barrientez, Director of Marketing at 469.215.2654 or email at gbarrientez@payercompass. com OR William Hicks, Business Development Specialist at 678.921.9223 or email at william. hicks@altarum.org. Providing a Software as a Service (SaaS) system that monitors and applies multiple regulatory and CMS sources, VisMed works in tandem with PROMETHEUS’ treatment bundles, resulting in greater pricing accuracy. Bundled Pay™ aggregates services performed by individual providers within a member’s comprehensive treatment plan into one episode of care. About Payer Compass Payer Compass provides healthcare reimbursement services with best-of-breed technology. Our team is making a difference in healthcare with progressive claim pricing and editing technology, yielding savings of 30–40% over networks. Payer Compass’s solutions extend beyond pricing and include plan analytics, consulting and Reference-Based Pricing program that incorporates our claim pricing and editing technologies, along with care management, patient advocacy and balance billing support. We serve the self-insured and a variety of health plans (government, indigent care and Indian health services tribal plans). Our services are backed with a team of healthcare and reimbursement experts driven by a passion for technology and a standard of excellence. Visit www.payercompass.com. About Altarum Altarum is a national nonprofit whose mission is to create a better, more sustainable future through ideas and action that transform American health and healthcare. Since 2007, PROMETHEUS’ open access episode definitions have been used widely for public reporting. PROMETHEUS Analytics power the price and quality transparency resources for the states of Maryland, Colorado, and New York. Large health plans, including Anthem and Cigna, are using the PROMETHEUS Analytics to drive their value-based payment programs. And now, the unique healthcare insights and answers powered by PROMETHEUS are wider in scope, easier to use, and more innovative than ever. Visit www.altarum.org. Atlas Insurance Hires New SVP of Finance & Compliance Atlas Insurance Management (Atlas), a Charlotte-based captive insurance management firm, has hired Gail Olsen as their Senior Vice President – Finance & Compliance. Based in the firm’s Charlotte office, Olsen brings to Atlas over 25 years of experience as a finance executive in a variety of industries. “We are delighted to have Gail as the newest member of our team,” says Martin Eveleigh, Chairman of Atlas Insurance Management. In Delaware, the captive regulators are dedicated exclusively to our captive insurance client’s needs, and work under the direction of our Captive Bureau leadership, directed by Steve Kinion. neonatal, dialysis and behavioral health case management. Sharon is known in the industry for her quality oversight, leadership and cost containing strategies. With her promotion, Sharon will be assuming the role of Stop-Loss liaison. About Hines & Associates, Inc. Hines & Associates, Inc. has been a leader in professional managed healthcare since 1987. Hines provides precertification (utilization management), advocacy, care coordination, case management, specialty case management, chronic condition management (disease management), Healthy Tomorrows Prevention, onsite lab and biometric screenings and total population management. Preferred by Stop-Loss, URAC accredited. Contact Anna Hansen, CSFS, Director of Sales & Client Solutions, at 800-735-1200 x3702, ahansen@hinesassoc.com and visit www.hinesassoc.com. Northshore International Insurance Services, Inc. Announces Two New Shareholders As of January 1, 2018, Charles H. Betz, III, (Chab) and Tammy Burns have become Principals and Shareholders of Northshore International Insurance Services, Inc. [“Northshore”]. As Corporate Vice Presidents, Mr. Betz and Ms. Burns have been long-standing and highly valued members of the Northshore Management Team. While Mr. Betz has been active in conducting and managing Property and Casualty claims and compliance reviews, he is the principal practice leader of Northshore’s Lloyd’s Coverholder audit team, which reviews more than 400 Lloyd’s Coverholders annually. In addition to his more than 30 years of claims management and audit experience, he has earned Chartered Property/Casualty Underwriter and Casualty Claim Law Associate designations. Mr. Betz earned his B.S. from Yale University, New Haven, Connecticut. About Northshore International Insurance Services, Inc. Founded in 1988, Northshore has provided expert professional services for 30 years to diverse and sophisticated risk taking clients including the self-funded and stop loss community by providing Excess Claims Management and effective audits of Medical Stop Loss, Workers’ Compensation, and General Liability; comprehensive reviews of Managing General Underwriters (MGUs), Lloyd’s coverholders, TPAs and Service Providers; Managed Care claim solutions; and Subrogation recovery services through its subsidiary, International Subrogation Management. Contact David W. Ives, CEO; Stephen V. Murphy, COO or Mark E. Scerra, President at 978.745.6655, or at dives@ niis.com, smurphy@niis.com or mscerra@niis. com. Please also visit our website at www. niis.com. Ann Tripp of Opus Investment Named to Stemconnector’s 100 Corporate Women Leaders in STEM Ann K. Trip is the Senior Vice President, Chief Investment Officer / President of Opus Investment Management, Inc., a holding company of The Hanover Insurance Group. The Hanover Insurance Group, Inc. (NYSE: THG) is the holding company for several property and casualty insurance companies, which together constitute one of the largest insurance businesses in the United States. The Hanover distributes its products through a select group of independent agents and brokers. Together with its agents, The Hanover offers standard and specialized insurance protection for small and mid-sized businesses, as well as for homes, automobiles, and other personal items. Through its international member company, Chaucer, The Hanover underwrites business at Lloyd’s of London in several major insurance and reinsurance classes. A wholly-owned subsidiary of The Hanover, Opus Investment Management is an SEC-registered investment advisor that focuses on managing fixed income portfolios for institutional clients, such as insurance companies, pension plans and public entities. Opus has more than $10 billion in assets under management and a long and distinguished history of delivering competitive investment results and exceptional service. Administration degree from Boston University. She serves on boards and subcommittees of several nonprofit organizations, including Fallon Community Health Plan and the Health Foundation of Central Massachusetts. Learn more at stemconnector.com. Gold Members PartnerRe Appoints New Heads of Property & Casualty and Specialty Lines Charles Goldie appointed Head of Property & Casualty CEO Emmanuel Clarke to head up Specialty Lines with Greg Haft as Deputy PartnerRe Ltd. announced that Charles Goldie, formerly CEO of Specialty Lines at PartnerRe, has been appointed CEO of Property & Casualty, following the retirement of Tad Walker who previously held that role. Mr. Goldie has headed up PartnerRe’s Specialty Lines business since 2010 and as a member of PartnerRe’s executive management team, has been instrumental in establishing the Company’s long-term strategy and organizational structure. Previously he held the position of SVP, Head of Specialty Lines for PartnerRe US from 2002 to 2009 and Deputy Head PartnerRe Global from 2014, responsible for all PartnerRe Global Non-life business. He will relocate from Zurich to Stamford, Connecticut, U.S. for his new role, effective January 15, 2018. CEO Emmanuel Clarke will take overall responsibility for Specialty Lines assisted by Greg Haft who has been appointed Deputy CEO Specialty Lines, effective January 1, 2018. Mr. Haft will lead within Specialty Lines, a newly formed unit of Specialty Property, Marine and Energy. Previously Head of Global Catastrophe and Property, North America, Mr. Haft has been responsible for Catastrophe since he joined PartnerRe in 2013. Commenting on the announcement, Mr. Clarke said, “As an established leader at PartnerRe, Charlie brings experience and stability for our clients and brokers in P&C who will continue to receive the same quality service from PartnerRe. Charlie’s success in building client relationships and delivering reinsurance solutions across a wide spectrum of markets will translate well to our P&C business. “At the same time, I would like to congratulate Greg on his promotion to Deputy CEO Specialty Lines. His long and successful track record in property catastrophe coupled with his leadership skills made him an excellent choice for this positon and I look forward to his support. “In both cases, I am very pleased that we have been able to draw on the strength of our internal talent to fill these important positions and to provide meaningful opportunities for growth for our leaders.